Most have heard of the city that never sleeps. It could be because of the lights or maybe the energy or perhaps it's the giant monsters trying to demolish the place! Do you have what it takes to become the King of New York? This fast paced game will keep you on your toes and get you thinking how you're going to win. 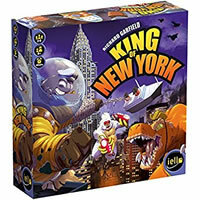 King Of New York is a well liked game for many gamers and is a great game to challenge your friends and family with. It hits a great compromise of fun, time to play, ease of how to learn how to play and can be quickly learned. Skim through the game rules to get a feel for how to play. Add King Of New York to your gaming collection and play it today! You are trying to earn 20 Victory Points or be the last Monster standing to win the game. You get 1 game board, 64 cards, 46 tokens, 8 dice, 6 Monster boards, 6 cardboard figures and 6 plastic stands, a bunch of Energy cubes, 45 Building/Unit tiles and the official King Of New York game rules and instructions. Please keep in mind that the official King Of New York board game rules and instructions could be different depending on the game version you have. The rules below are some of the exact directions on how to play King Of New York. Share with us your comments, funny stories, tips, advice, strategies, creative ways to play, questions about how to play, problems with the rules or anything you want about King Of New York. All submissions will be reviewed within 24 hours. Click here to add your King Of New York comments.